Corporate events or business functions can be long, drawn out affairs. To keep people interested and productive, you need to offer them good food. Of course there's a lot to consider when your running a seminar or training session, but planning the catering should be your top priority. Corporate catering is a specialist skill and if you're hosting the function or conference it's important to get it right. It's not only important to the success of your event but it's your opportunity to ensure your guests leave with a good impression of your business. Leveraging the mouthwatering skills of your corporate caterer could help you build the reputation of your own company. Putting on a beautiful meal will make your guests feel appreciated. It's a good way to divide up the day and let people clear their head and eat something fresh and tasty to re-energise and it can offer invaluable networking opportunities. People are often more comfortable socialising while eating together, informally sharing their thoughts on the day. Corporate catering providers are the experts. Their team will plan the menu matched to your guest’s requirements and the style of event. They know how the food should be prepared and presented to keep your attendees happy. When it's really done well, professional corporate caterers can make a corporate event spectacular. Whether you need a simple selection of light bites, a three course boardroom lunch or someone on hand to manage your whole event, look for an experienced caterer who can provide you with both top quality food and flawless service. Make sure you find a supplier you trust. Ask around - word of mouth can be the best kind of recommendation and you want to be associated with tasty, imaginative food, not soggy sandwiches. There's some healthy competition in town for our cafés and restaurants. Food trucks may be relatively new but they are already adding richness and vibrancy to New Zealand cities and some are even building up big followings of regulars before opening their own non-mobile restaurant. And, if you think food trucks only serve up deep fried dishes, you haven't tried the offerings from the new generation of mobile eateries. From their creative names to their tasty and equally creative menus, food trucks not only add some fun to the dining scene, these days they blend it with high quality ingredients and professionally prepared cuisine. Healthy food and using locally sourced ingredients are philosophies shared by many modern food truck owners and they're concepts that are increasingly important to customers. People are looking for a food experience that's gentle on the planet as well as fresh, new and exciting. Food trucks also provide consumers with plenty of choice. Because a group of food trucks can cater for a wide range of tastes, it's a great way to enjoy a lunch out with colleagues or friends. They have a way of bringing all sorts of communities together. Of course, the obvious advantage of the food truck mobile catering over a café or restaurant is its mobility. Food trucks come to you - almost anywhere. They're even becoming popular for weddings where couples want a more relaxed casual experience. Lots of people also love the personable nature of food trucks - it's a very direct relationship between customer and owner. For many food truck owners, it's not just their business but their passion and many customers get a kick out of knowing they're supporting someone's dream. One way or another, the food truck movement definitely looks set to flourish. The road ahead for the Food Truck is on the up and up. And why wouldn't it be? People love food trucks because their food is delicious. From tasty, free range meat dishes to delectable desserts, food truck owners around the country are cooking up memorable meals. Mobile catering is a win win for the owners and customers alike. A food truck is an affordable way for a young chef to get started with their own business and it's also a fun way for people to buy great food they'd pay a lot more for in a restaurant. Mobile catering, or restaurants on wheels, are perfect for people who want to work for themselves. The attraction of running a mobile catering business is that it comes with lower startup costs and greater flexibility. Operating from a food truck can allow owners to try out new ideas and menu items more easily which also means the food can be more exciting. Eating from Food Trucks is perfect for foodies and those who enjoy new eating experiences, one of the reasons that mobile catering is on the rise. Creative, entrepreneurial food trucks are offering unique flavours from different cultures around the globe. That means mobile catering is bringing innovative, quality food to the streets at cheap prices. Most Food Trucks serve anything but typical dishes. Yet despite their exotic ingredients, gourmet range of meals or unique, cutting edge creations, they still manage to be highly affordable. Another reason why people are choosing to eat at food trucks is because of their convenience. They are the new Fast Food option. But where fast food traditionally has less healthy connotations, many food trucks take pride in their reputation for healthy alternatives and locally sourced produce. Food trucks are also inherently social and fun for the whole family. It can be difficult to try to find a restaurant that everyone in the family wants to eat at. Mobile catering trucks often gather together, offering great variety, and usually, something to everyone's taste. Many customers also appreciate meeting the people making and directly selling their food because it personalises the eating experience. Whatever the reasons, it looks like Food Trucks are here to stay so try them out and have fun being part of the growing Food Truck community. There are many elements to consider when planning a wedding but trends have been showing that the food is increasingly important. Guests care more and more about what they're eating so the quality of the catering can really set the tone of the wedding day. Experienced wedding caterers have a huge wealth of knowledge so choosing a quality caterer gives you the chance to tap into that to ensure the success of your own celebration. Good caterers will never forget that it’s your event. A professional wedding caterer will listen carefully and get to know what you’re looking for so they can offer fresh ideas that will complement the style of your wedding. It's your big day so you deserve to have exactly what you want. Quality caterers appreciate the food on your wedding day is not only about taste, but presentation as well. Delicious food is even more appetising when presented well and can also add a sense of theatre to the proceedings at your wedding venue. It can provide a focal point for the wedding day and offer a level of entertainment as well as keeping all the guests well fed and happy. Clever caterers can serve delicious food on a budget, providing out-of-the-ordinary yet cost-effective menus. They are experienced in finding different, exciting ways to serve food and present something tasty and unique without costing the earth. At El Mono Loco we bring our philosophy and passions for food to our wedding catering which means the best local, seasonal produce and ingredients are used as much as possible. We care about your requirements, we will create a menu that reflects your individuality and style, and we'll deliver you and your guests delicious food that ensures your wedding is a successful and memorable one. Bon appétite. One of the most important decisions when planning a wedding is around feeding your guests. Assessing potential caterers can be confusing. Here are some tips on what couples should ask when choosing a wedding caterer for your celebration. · Ask what style of food they prefer to cook, if there is anything new and fresh they are particularly excited about cooking, or anything they would suggest. Choose a caterer whose experience and suggestions you feel you can trust and whose style will reflect you and your partner's. · Where do they source their ingredients? Decide if having local and seasonal ingredients is important to you and if so, ask about it. · Find out what type of services are available at your wedding venue so you can match them with the services you need your caterers to provide. Are there kitchen facilities? Do the caterers prefer to bring the food to your venue or cook on site? Do they set up, serve and go or provide a full service? · Find out if they have ever catered an event at your venue. You want a caterer who will have some understanding of the space before the big day but even if a potential caterer has never done an event at your wedding venue, they should have a plan for how they will prepare and deliver your meal in that space. · Understand clearly the breakdown of what each caterer will deliver for the price so you can compare proposals and determine which is best for you. 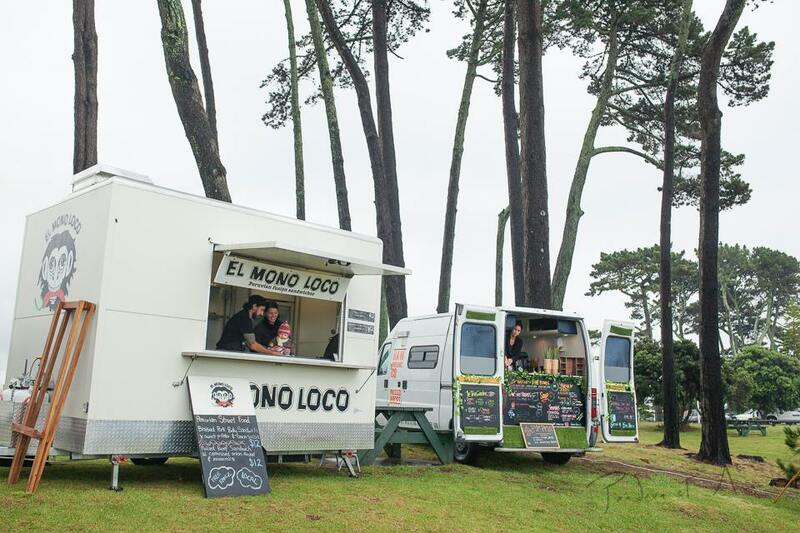 El Mono Loco are experienced wedding caterers focused on high quality, amazingly fresh and delicious food. Contact us today to discuss your requirements. This is something I am sure a lot of you are juggling, having a baby and running a business, not having the luxury of maternity leave and the constant mind battle of being a mum and working at the same time. Sofia was born in Sept and El Mono Loco had not quite been running for a year, I was completely naive, thinking that nothing would change and she would just fit in with me and my life. To a certain extent she did. I did my first catering job when she was 2 weeks old and prepped all the canapes with her in the front pack. She came to the night markets all summer long and was quite content to sleep in her pram come bed time. But I wouldn't change a thing. I love my job. I love making people happy with food. I love the stress that comes with the responsibility of cooking a meal for couples on what is the most important and memorable day of a their lives. But more importantly I love our daughter, more than life itself. Its the love that you can only feel once you have had a baby, a love that you didn't realise was even possible. For all the stress and troubles that come with owning your own business and trying to grow a little person, I feel lucky, lucky that when I have down time I can spend all day with her, lucky that she will grow into this amazing little person for being exposed to so many things as a child and lucky that I don't have to go to "work " as such every day and leave her in care 7 days a week. That being said, if I won lotto tomorrow, I think I would enjoy being a full time mum! But hey that is just a dream! Delicioso is about creating fresh, delicious and healthy meals for busy people. Every week our experienced chef creates new and tasty meals for you to enjoy at home. It's easy to order and pay online and pick up at one of our designated drop-off points. No thinking, no cooking needed. Just reheat and enjoy. Do you run out of time and energy to create dinner every night? Do you struggle to find quick, easy and healthy takeaways for your family? Like us on Facebook and sign up to our Delicioso mailing list below to receive our weekly menus direct to your inbox. @foodtruckfridaynz last winter season was a huge hit! We can't wait to bring this to you every Friday from the 6th May for the winter months! It's great place to come and grab a bite to eat on the run! Plus you get to do a bit of shopping at the @rpmclothing store while you wait for dinner!! !